I’m so excited to be sharing the first Morphe Me package of 2018! I’ve been subscribed to this monthly brush package for over a year now, and while I definitely don’t need any more brushes, I just can’t bring myself to cancel the subscription. It’s such a great value, and I’m a serious brush-junkie. To ring in the new year, this month’s brush package includes 3 different face brushes from the gorgeous Gunmetal collection. These brushes also feature Morphe’s sleek new logo font. G39 Deluxe Foundation: synthetic bristles. This smaller, slightly dense brush offers a unique shape that is neither dense nor fluffy, but a great middle ground. ideal for blending out foundation and concealer. It’s not round or puffy, but thicker and fluffier than your standard flat paddle-style foundation brush. Flat paddle brushes tend to just wipe foundation on the skin, leaving a streaky finish. The G39 is a much better alternative, as it diffuses liquid products really well, especially if you’re seeking a soft and natural finish! This is my favourite brush from this month’s package. G5 Pointed Powder: synthetic bristles. This fluffy brush has a rounded, tapered end. The fluffiness makes this ideal for powder, but the size and tapered edge mean it can be used all over the face! It’s great for setting concealer under the eyes, setting foundation, or applying blush to the cheeks. I personally love a brush like this to blend away the excess powder used when baking your contour. They’ve launched a few brushes that are similar in shape, however I have none in my collection with this exact size, fluffiness, or tapered top. 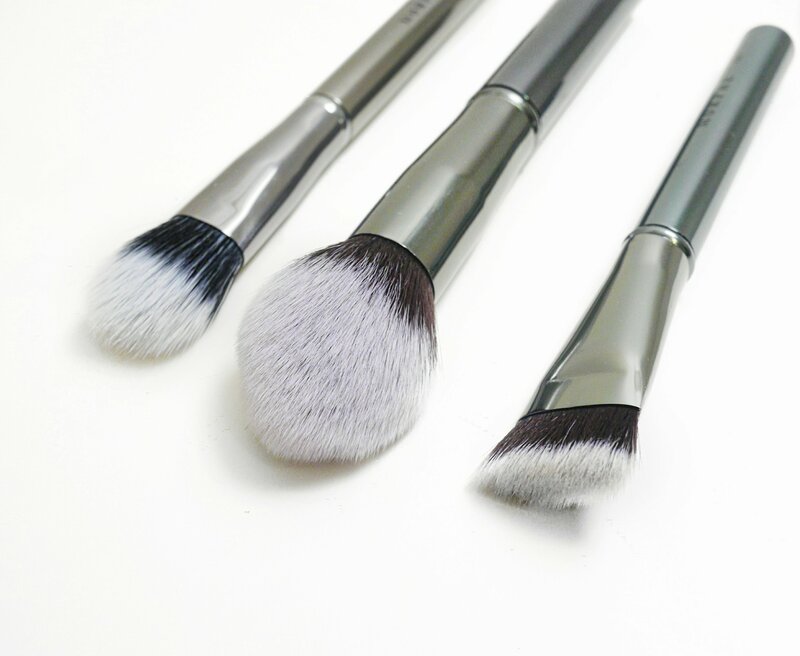 It initially looks similar to the E3 and the Real Techniques brush, however these 2 are larger, less dense, and not as tapered. G42 1” Flat Contour: this thin brush has a flat top, and is a perfect shape for contouring to sculpt out your features – especially the nose area. Personally, I find a shape like this to be a tad too small and precise for contouring my cheeks, but it works perfectly for the nose. This is the big brother to the G41 (which came in the May 2017 Brush package!) The G41 is tiny compared to this one; the G42 is large, a bit thicker, and has slightly longer bristles. I use a brush like this to contour my nose every day – and this might just become my new favourite! 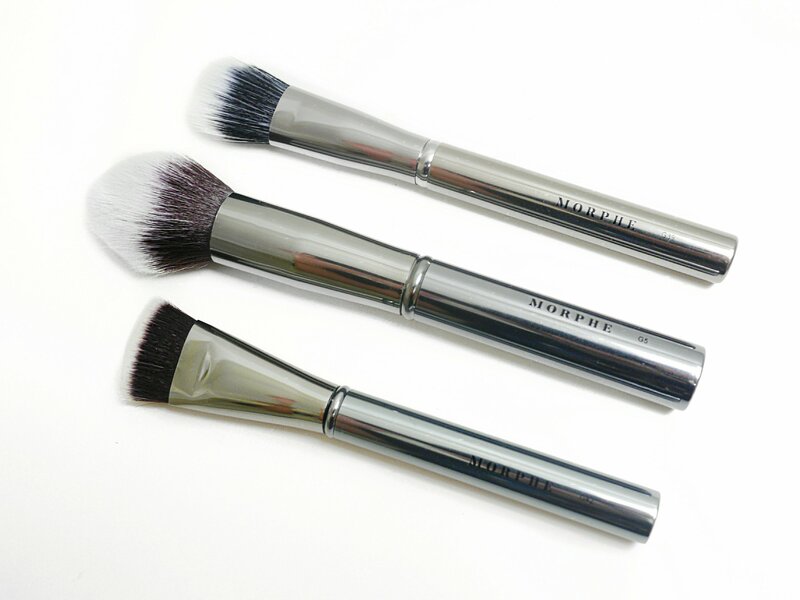 All of the brushes are extremely soft, and the Gun Metal collection feels very sleek and luxurious. To check out the previous Gun Metal brushes included in the Morphe Me subscription, you can read my review here! Another new feature Morphe has added is the ability to skip certain brushes from each month and swap them for a different one! You can read more about that here. Next Post YouTube’s New Update: What Does This Mean For Smaller Accounts?